Voted 'Most Magical Perfector' by Cosmopolitan and 'Best Skin Plumber' by Harper's Bazaar, this is an award-winning formula to intensively moisturise, repair and plump the skin. 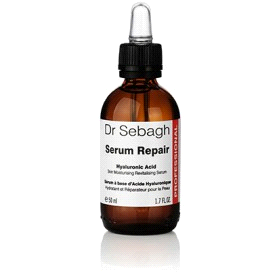 Serum Repair morning and night to your perfectly cleansed face prior to moisturiser. Use any time for an instant radiant look. Shake before use. 1 - Evening: Give yourself time for a gentle and soothing massage with Serum Repair on the face and neck until your skin feels soft and velvety. Then apply Crème Vital (put Hyperlink to this product) or Natural Replenishing Cream (put Hyperlink to this product). Save nearly £58 when you buy Professional Size Pure Vitamin C Powder Cream! In the morning, apply 1/4 graduation of Pure Vitamin C Powder Cream to a perfectly cleansed face and neck. The soft pressure of your fingertips will turn the powder into a light cream which is quickly absorbed by the skin. Alternatively, mix 1/4 graduation of Pure Vitamin C Powder Cream with the appropriate product (High Maintenance Cream, Natural Replenishing Cream, Vital Cream or Serum Repair) in the palm of your hand and apply to the face and neck every morning. Vitamin C is the most powerful antioxidant of all vitamins that combat free radicals due to environmental aggression (sun, pollution, stress.) Vitamin C's role in the collagen synthesis improves elasticity and retextures skin by perfecting tone and pigmentation. 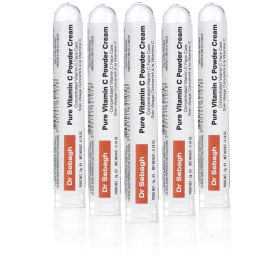 Vitamin C loses 85% of its potency within one hour of opening the jar, Dr Sebagh Pure Vitamin C 20% emulsion powder cream patented is a revolutionary way to overcome the stability problem of Vitamin C.
PURE VITAMIN C POWDER CREAM is indicated for the prevention and treatment of skin aging process. 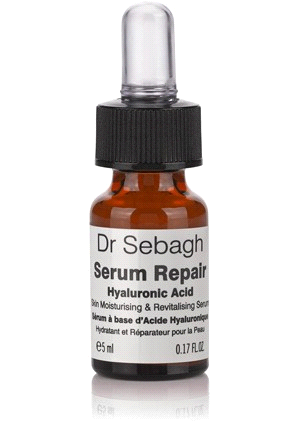 The application of Stable Vitamin C is very useful for enhancing the results of SERUM REPAIR, CRÈME VITAL, CRÈME NATURAL HORMONE LIKE EFFECT and CRÈME HIGH MAINTENANCE (Antioxidant action, reactivates collagen, more luminous, more revitalized skin). Voted 'Top Ten Face Mask' by Glamour. A combination of Azelaic and lactic acid to exfoliate dead layers of skin for a faster cell turnover. An excellent pre-party ritual, skin looks instantly lighter, brighter and smoother. For that wow factor of highly polished skin use once or twice a week. In the morning, apply 1/4 graduation of Pure Vitamin C Powder Cream to a perfectly cleansed face and neck. The soft pressure of your fingertips will turn the powder into a light cream which is quickly absorbed by the skin. Alternatively, mix 1/4 graduation of Pure Vitamin C Powder Cream with the appropriate product (High Maintenance Cream, Replenishing Cream, Vital Cream, Serum Repair or Rose de Vie Sérum Délicat) in the palm of your hand and apply to the face and neck every morning. For the ultimate overnight skin treat, mix with a few drops of Serum Repair, (put Hyperlink to this product) to plump and hydrate. Mix with Pure Vitamin C Powder , (put Hyperlink to this product) to brighten dull skin. 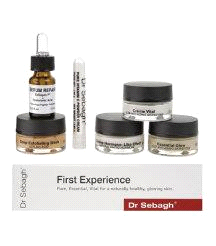 Experience the ultimate in body care from Dr Sebagh. 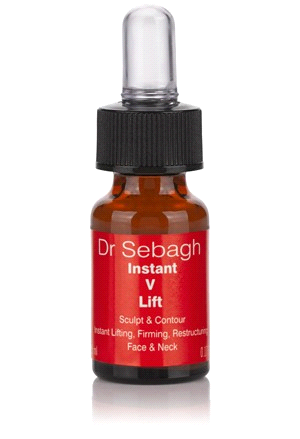 This NEW, total body treatment has been expertly created by Dr Sebagh to restructure, lift and firm the skin, all over. The innovative, intensive formula is enriched with active contouring ingredients and hyaluronic acid to leave skin deeply moisturised, supple and radiant looking. 1 - Evening: Give yourself time for a gentle and soothing massage with Serum Repair on the face and neck until your skin feels soft and velvety. Then apply Crème Vital (put Hyperlink to this product) or Natural Replenishing Cream(put Hyperlink to this product) . Ingredients : Aqua/Water/Eau, Sodium Ascorbyl Phosphate, Dimethyl Isosorbide, Pseudoalteromonas Ferment Extract, Sodium Hyaluronate, Butylene Glycol, Rhizobian Gum, Citric Acid, Phenoxyethanol, Hibiscus Abelmoschus Seed Extract, Ci 77891 (Titanium Dioxyde), Hydrolyzed Algin, Chlorphenesin, Hydrolyzed Soy Protein, Chlorella Vulgaris Extract, Maris Aqua/Sea Water/Eau De Mer, Hydrolyzed Wheat Protein, Magnesium Aspartate, Zinc Gluconate, Xanthan Gum, Methylparaben, Vitis Vinifera (Grape) Vine Extract, Lecithin, Magnesium Nitrate, Copper Gluconate, Ethylparaben, Caprylyl Glycol, Butylparaben, Propylparaben, Tripeptide-10 Citrulline, Carbomer, Isobutylparaben, Methylchloroisothiazolinone, Magnesium Chloride, Tripeptide-1, Methylisothiazolinone, Triethanolamine. 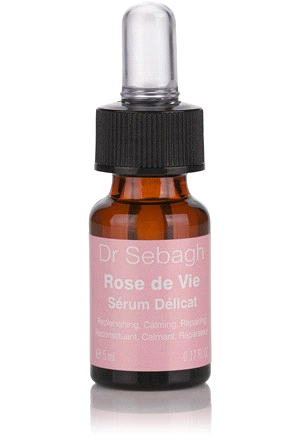 and Rose de vie Serum Delicat"
The NEW ultimate lifting treatment from Dr Sebagh. This unique blend of more than 10 active ingredients immediately tightens and firms the skin, whilst providing powerful anti-ageing benefits. Voted 'Best wash-off cleanser' by InStyle, Dr Sebagh Foaming Cleanser deeply purifies the skin and removes even the most stubborn traces of make-up (including mascara). This gently deep-cleans skin leaving it feeling fresh, soft and comfortable. For a healthy, glowing skin use twice a week with Deep Exfoliating Mask(put Hyperlink to this product). 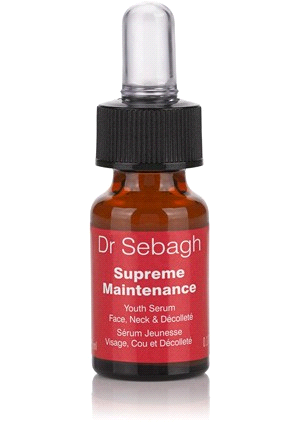 Dr Jean-Louis Sebagh In the press ... "I swear by Dr Sebagh Foaming Cleanser ... my skin has never looked better" Daisy Lowe, Elle Magazine Application Use morning and evening to cleanse your face and neck. 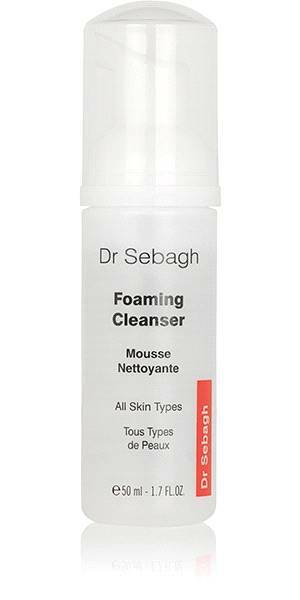 Apply Foaming Cleanser directly to your skin without using water. Massage with circular motions and wait a few seconds. Wipe off or rinse with warm water. Science The deeply purifying wash removes the dirt, debris, makeup and mascara but also takes care not to disturb the skin's barrier function.